A DIY face mask for acne is what I’m teaching you today to make. You can NOT use it if you have dry skin, it’s for combination or oily skin. This DIY face mask for acne contains a very rare ingredient; aspirins. Yes, the ones you take if you have a headache. Why aspirins you might think? Well aspirins are made from salicylic acid also known as Beta Hydroxy Acid, BHA in brief. BHA is known for restoring the skin or/and removal of dead skin cells. What the also do is clean out pores, and they even reduce red spots! 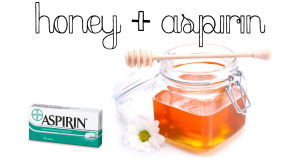 A homemade aspirin mask is easy and cheap to make! Want to know how you can make this mask, and how to use it, well… Read on! Aspirins: Read above what they contain, buy cheap ones. Lemon juice: Lemon contains citric acid and AHA (Alpha Hydroxy Acids), which exfoliate (remove dead skin cells). Honey: Honey is especially moisturizing properties. In addition, honey contains lots of vitamin C and several B vitamins. I always use four aspirins for 1 treatment. Step 1: Put the aspirin in a bowl, and mash finely with a spoon into a powder. Mash the aspirins as finely as possible! Step 2: Then add the honey. I use honey because this flower which has thicker texture than honey from a squeeze tube. 1.5 teaspoon of honey is sufficient for the entire face. Step 3: Add a few drops of lemon to the mixture. Step 4: Stir just as well together, and apply it to your cleansed face. Let sit for 10 to 15 minutes and rinse with lukewarm water. This really is one of my favorite DIY masks of all time. I do not want to exaggerate, but it made my skin very well in the time that I was prone to blemishes and red spots. Good luck and feel free to write a comment below when you tried it!